Coffee and Heels: Me in Marie Claire UK! My doubts were crushed when I saw this amazing photo of us (on Poppy's balcony with a fantastic view!) 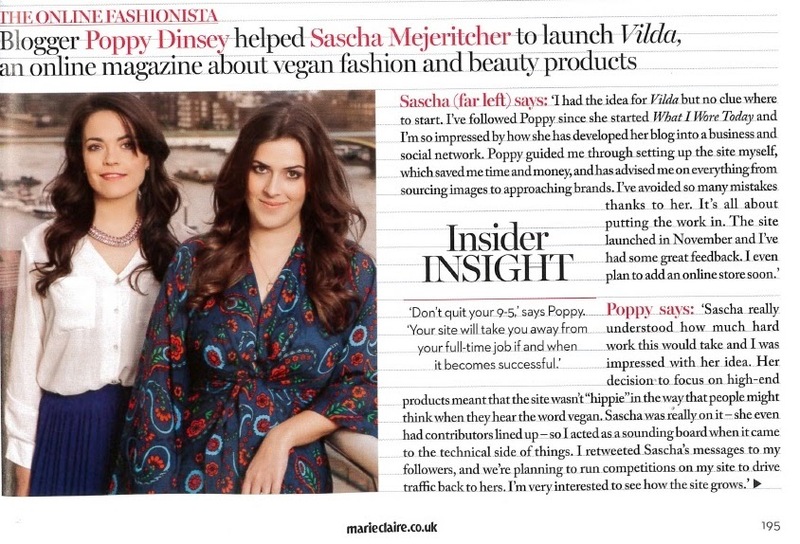 and a very well-written interview that gave a good picture of my experience (and, I hope, Poppy's) of the Marie Claire Inspire & Mentor Scheme. Being mentored was a wonderful experience and I'm not sure that Vilda would have ever existed without it. It feels surreal that, just a year and a half after moving to London, I'm staring at my face in one of the UK's biggest women's magazines. And my dream business is actually out there, with a web address and readers and articles. It may not be huge yet, but it exists. Just knowing that I did this is hands-down the most satisfying thing I've ever done in my life. If you live in the UK, check out page 195 of Marie Claire!